I discovered science fiction in the 5th grade and quickly tore through every science-fiction book in my school library. 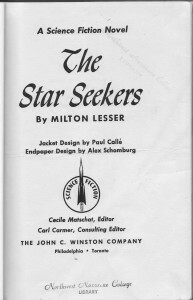 One of those books was The Star Seekers, by Milton Lesser. I probably read it twice, because a few scenes stayed vivid in my memory years later. I recalled it as the story of a young man who sets out to explore his world, only to learn that his world is not what he thinks it is–and that it’s in terrible danger. Not long ago I thought of that book again and decided to reread it. I did some research and learned that Milton Lesser was a pen name of Stephen Marlowe, who died in 2008. He wrote a lot of mystery novels under the Marlowe name, but between 1947 and 1965 he wrote a handful of science fiction novels as Milton Lesser. The book arrived last week, and I spent an evening reading it. To my surprise, although I had remembered the main outline of the story and a few scenes, I had forgotten many details that didn’t seem important when I was a young reader–details such as the author’s criticisms of candy, soda, and TV. I also hadn’t realized as a kid that the “science” part of this particular science fiction novel was pretty shaky. The Star Seekers wasn’t as good as other early favorites that I still love as an adult, such as Jack Vance’s Vandals of the Void and Dan Wickenden’s The Amazing Vacation. Still, it was entertaining to open the book and once again accompany Mikal, the young hero of The Star Seekers, on his world-changing journey.